There's a wide range of authenticity to MLS's many rivalry matchups, writes Alexander Abnos in his weekly Power Rankings. For over 20 seasons now, we’ve learned that Major League Soccer has no problem trying to conjure improvements out of thin air. At the start of the league, that desire manifested itself in the form of regular-season shootouts (to get rid of those unsatisfying draws), clocks that count down (so everyone knows where in the game it is), and bright, garish jerseys (to...appeal to the kids, I guess?). It wasn’t all bad. The league also added designated players, raised the salary cap, and placed expansion teams in soccer hotbeds. These were all instant improvements. But then again, all were things that could be improved, instantly. Now in its third year, MLS’s “Rivalry Week” is yet another manifestation of that same desire for instant improvement. 2016’s edition, though, proved once again that rivalries are not something one can force. They require years of history between two teams, usually combined with success for at least one of them, and always with a fair amount of drama between them. They do not require their own week. And they certainly don’t require any one authority speaking from on high and dubbing it a rivalry in the first place. “Everybody’s talking about rivalries this week. I got asked if it’s a rivalry,” Philadelphia Union head coach Jim Curtin told reporters, referring to his team’s matchup with D.C. United. The teams are located only 140 miles apart, but share precious little notable history together. Philly midfielder Chris Pontius has played for both teams. So has Fred. That’s about it. “If you have to ask if it’s a rivalry, it’s not a rivalry,” Curtin said. The game itself certainly didn’t play out like one. Often, it looked like neither D.C. nor Philadelphia had any strong desire to win a snoozer of a game (though Philadelphia eventually did). The other games the league opted to showcase this week drew the distinction between rivalries created and genuine. 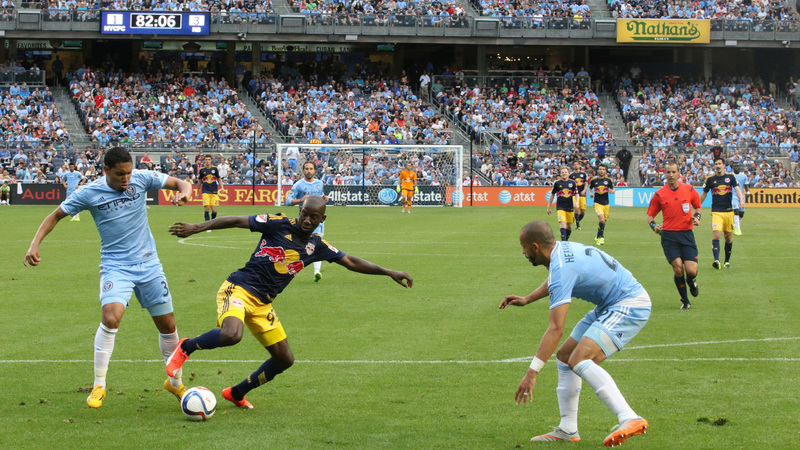 The Hudson River Derby displayed the biggest chasm between marketing hype and on-field reality. 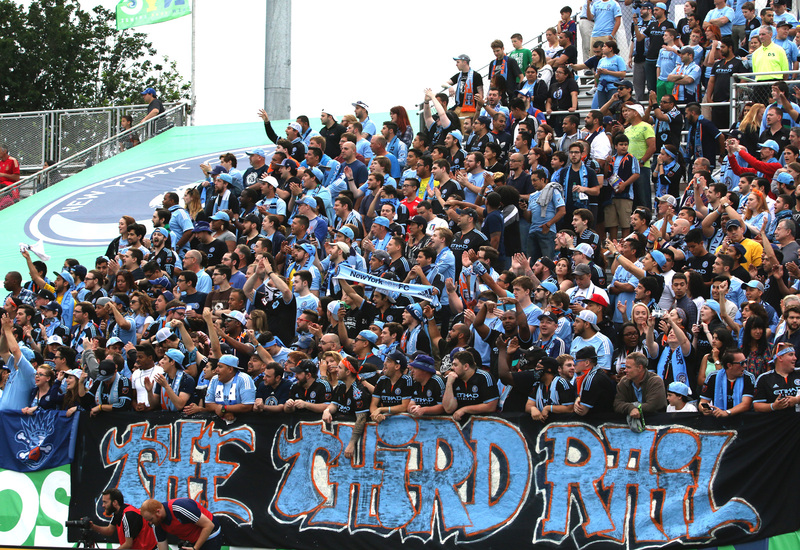 ​Yes, the division between NYCFC and New York Red Bulls supporters is very real, and touches on some uniquely American fault lines. That alone makes this an interesting matchup. But if it’s a rivalry, it’s one that completely lacks the most important component: Competition between the teams. The Red Bulls’ 7-0 victory was out of place only in terms of score, as the team has done nothing but dominate NYCFC since the latter’s entry into the league. 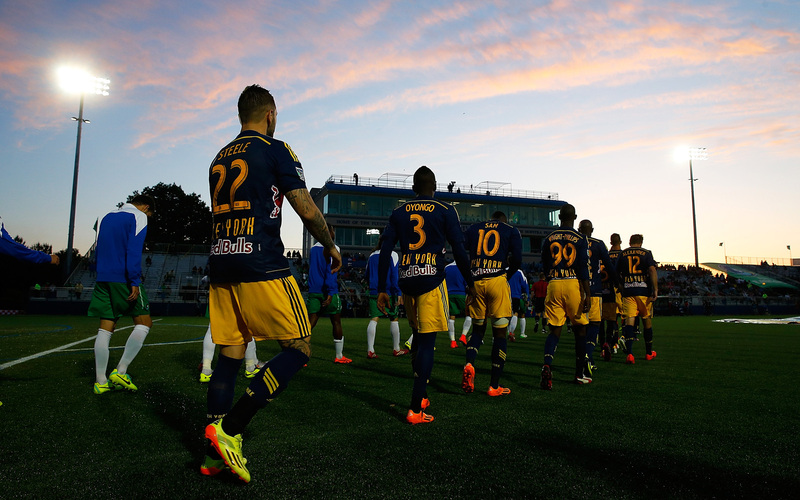 The New York Red Bulls and New York Cosmos walk out to line up ahead of their 2014 U.S. Open Cup clash at Hofstra University's Shuart Stadium. 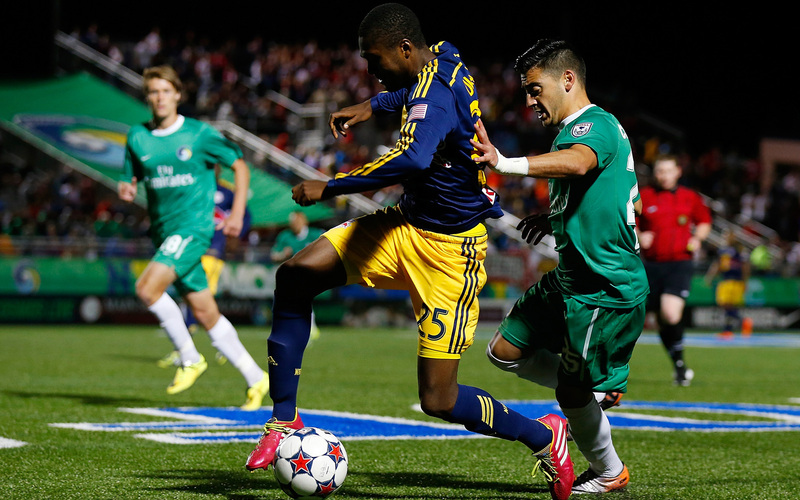 New York Red Bulls' Chris Duvall (25) takes on the Cosmos' Hagop Chirishian in their 2014 U.S. Open Cup clash. 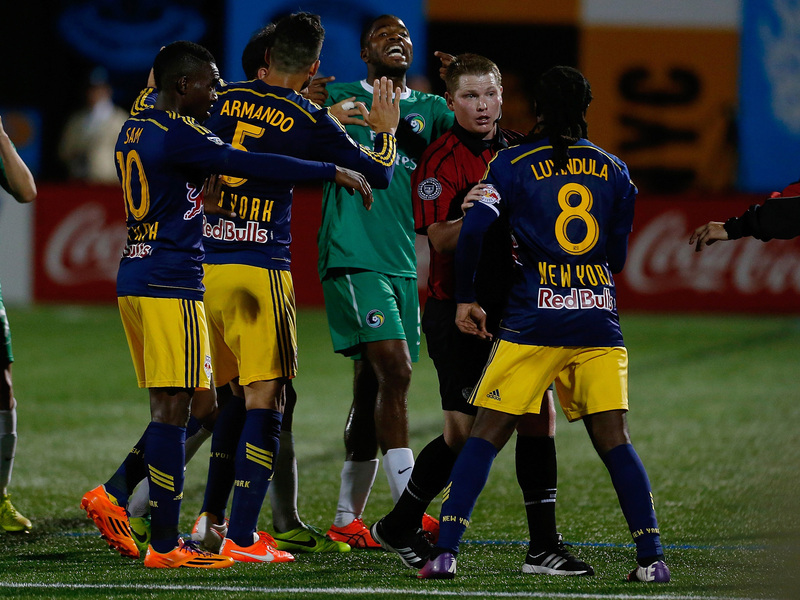 Tempers flare in the New York Red Bulls' 2014 U.S. Open Cup match against the New York Cosmos, which was won by the NASL team 3-0. 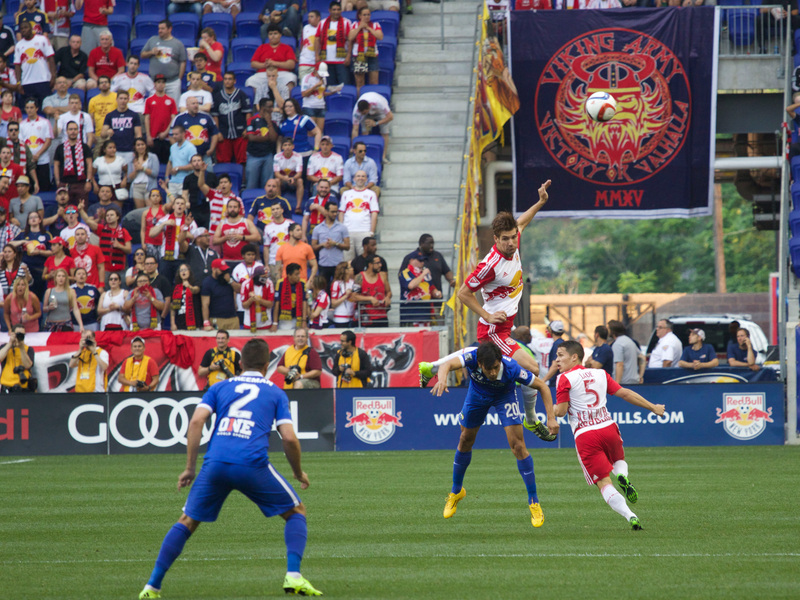 Ambroise Oyongo goes airborn in the New York Red Bulls' 2014 U.S. Open Cup match against the New York Cosmos. 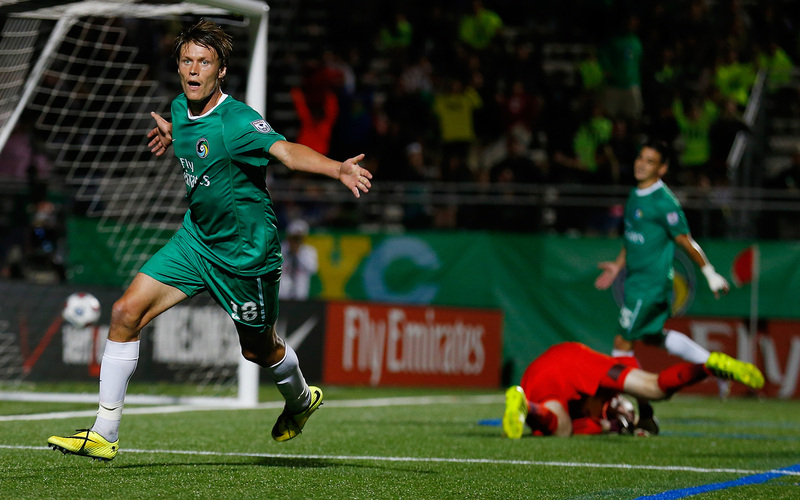 Mads Stokkelien celebrates one of his two goals in the New York Cosmos' 3-0 win over the New York Red Bulls in the 2014 U.S. Open Cup. Mads Stokkelien scored twice in leading the New York Cosmos over the New York Red Bulls 3-0 in the 2014 U.S. Open Cup fourth round. 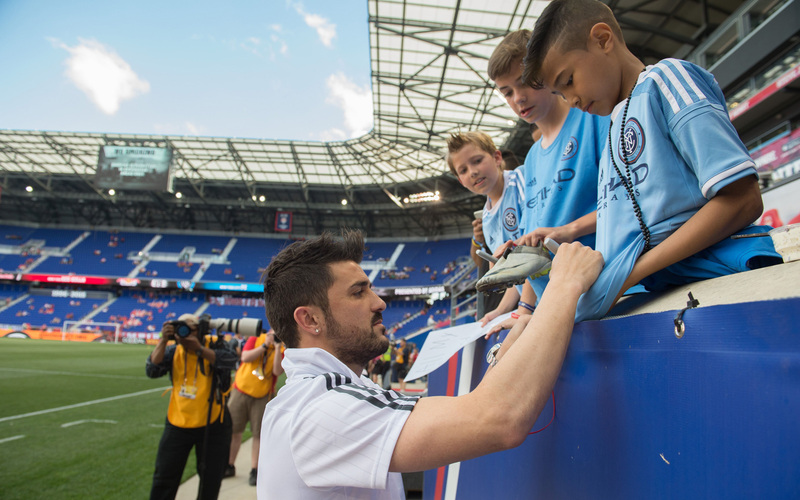 David Villa signs an autograph for a young NYCFC fan at Red Bull Arena in the club's first match against the New York Red Bulls. 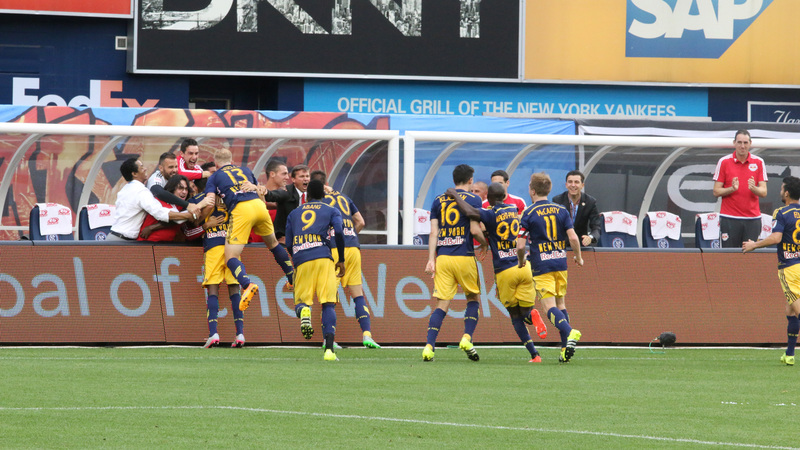 Red Bulls fans celebrate a goal from Bradley Wright-Phillips in the club's first match against NYCFC. 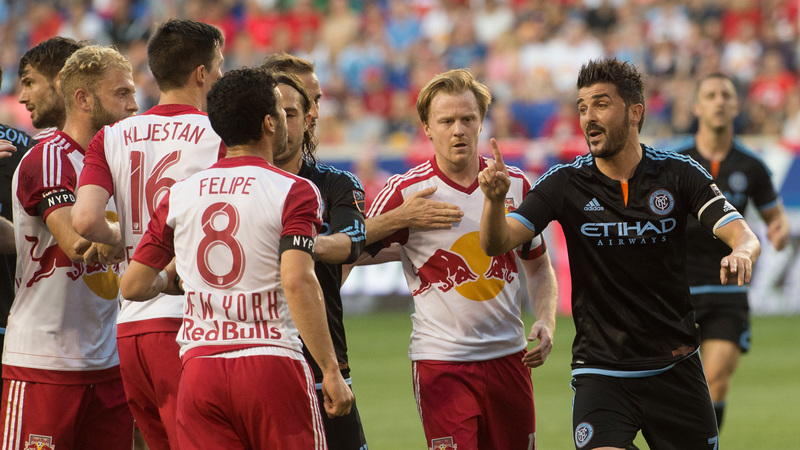 NYCFC captain David Villa, right, takes exception with Red Bulls midfielders Felipe, Dax McCarty and Sacha Kljestan in a heated moment in NYCFC's first match against the Red Bulls. 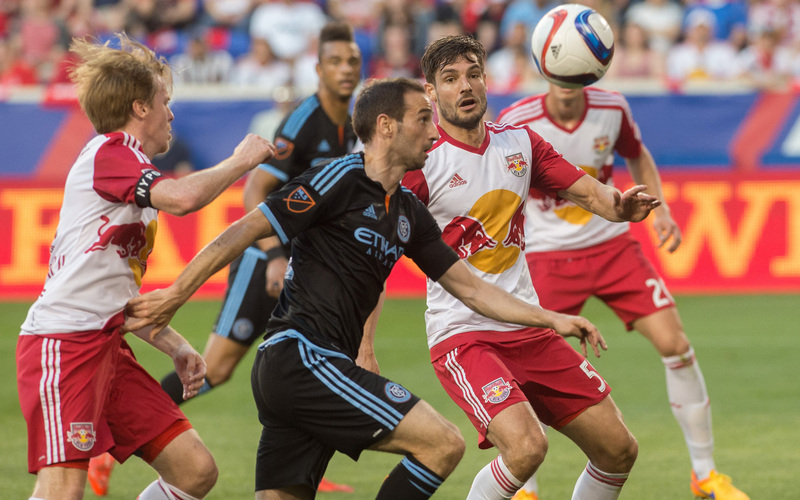 NYCFC's Pablo Alvarez tries to get by a throng of Red Bulls defenders in a 2-1 loss for the MLS expansion club at Red Bull Arena on May 10, 2015. NYCFC goalkeeper Josh Saunders makes a save on Red Bulls forward Bradley Wright-Phillips in the inaugural match between the two clubs, won by the Red Bulls 2-1. 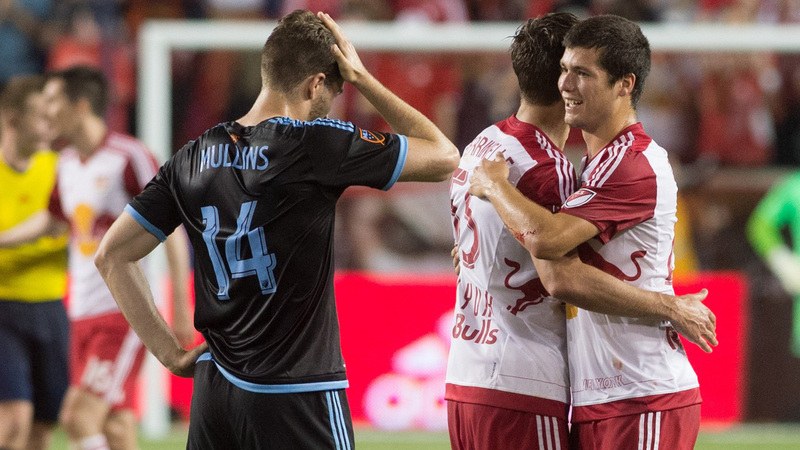 Red Bulls defenders Karl Ouimette, right, and Damien Perrinelle congratulate each other while NYCFC's Patrick Mullins looks on after a 2-1 Red Bulls victory. 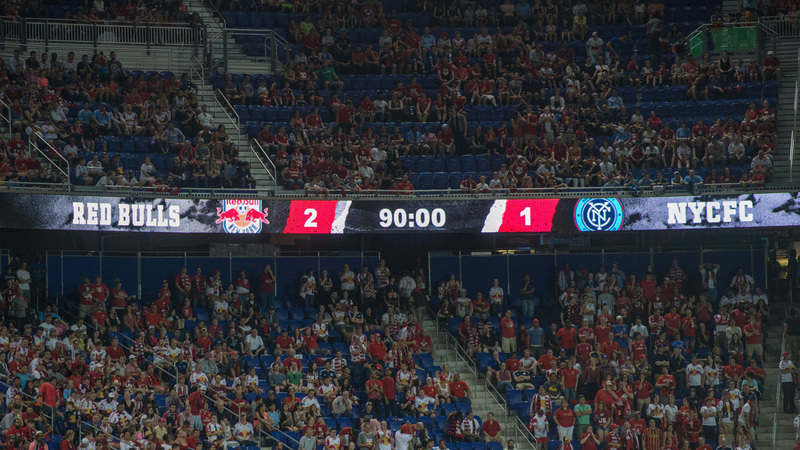 The scoreboard tells all, as the Red Bulls win the inaugural MLS match against expansion club NYCFC on May 10, 2015 at Red Bull Arena. 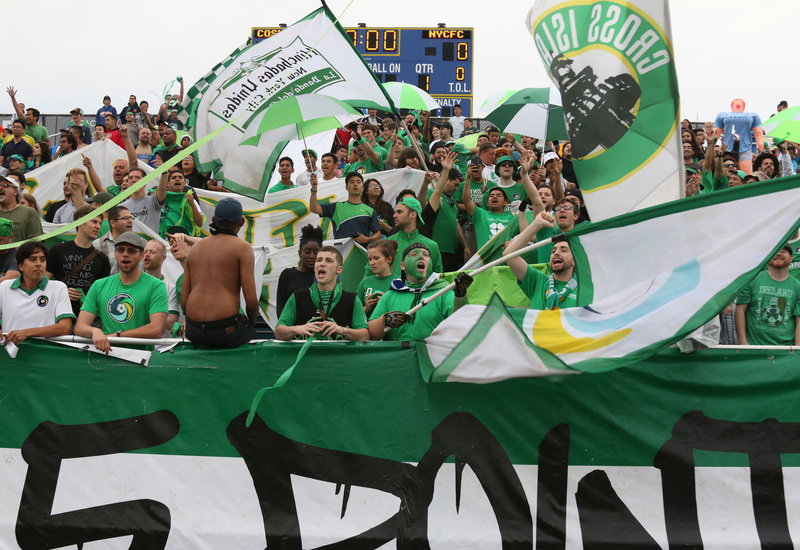 The New York Cosmos supporters' section helps set the atmosphere for their fourth-round U.S. Open Cup match against NYCFC. 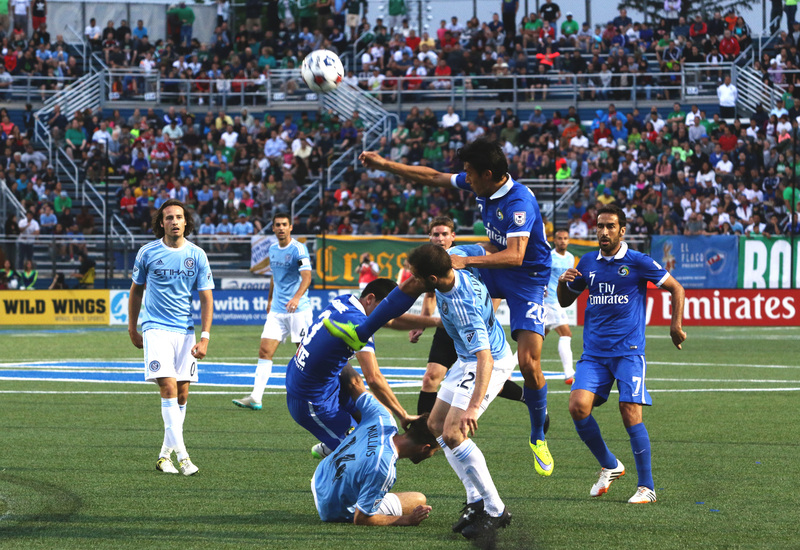 The game, dubbed the East River Derby, was the first match between the two sides. 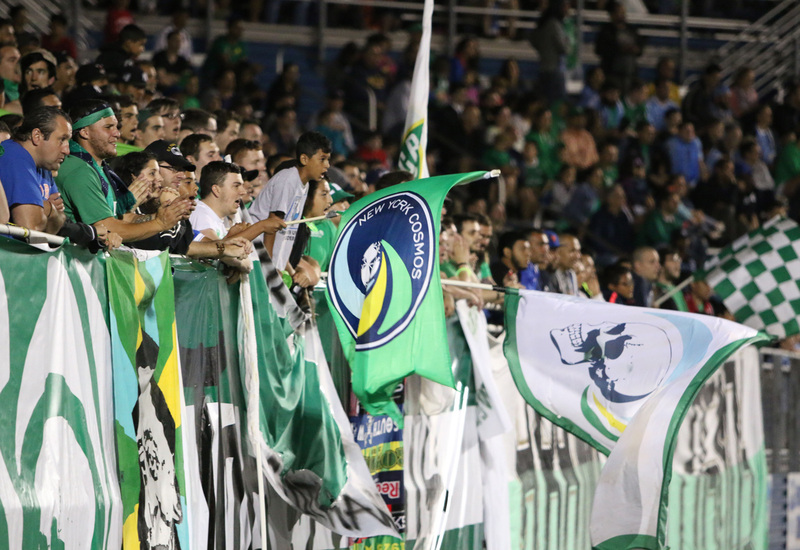 The New York Cosmos supporters look on with focused apprehension as they watch their Cosmos fight to come from behind against NYCFC in the second half of their U.S. Open Cup fourth-round match. 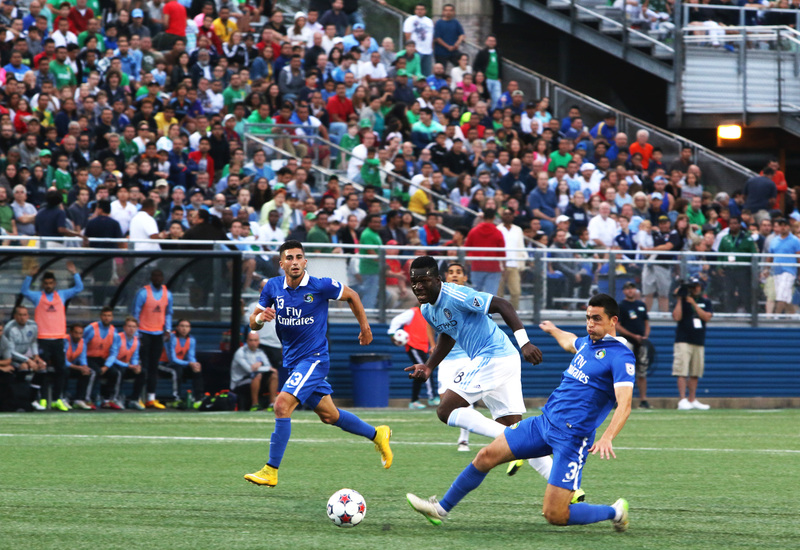 Over 1,000 New York City FC supporters made the trip to Hofstra University’s Shuart Stadium, the home of the New York Cosmos, to witness the inaugural match between the two sides. New York Cosmos defender Hunter Gorskie (3) and midfielder Sebastian Ignacio Guenzatti Varela (13) chase after NYCFC midfielder Kwadwo Poku (88) as he runs toward goal. New York Cosmos defender Hunter Gorskie (3) and midfielder Hunter Restrepo (20) get into a physical midfield battle with NYCFC midfielder Pablo Alvarez (22) and forward Patrick Mullins (14). In the 24th minute, NYCFC midfielder Kwadwo Poku (88) successfully executes a bicycle kick, beating Cosmos defender Ayoze Garcia Perez (17) and goalkeeper Jimmy Maurer (1) for the first goal in the teams' first matchup. NYCFC midfielder Kwadwo Poku (88) and forward Patrick Mullins (14) run toward the away supporters section to celebrate Poku’s goal in front of their fans. 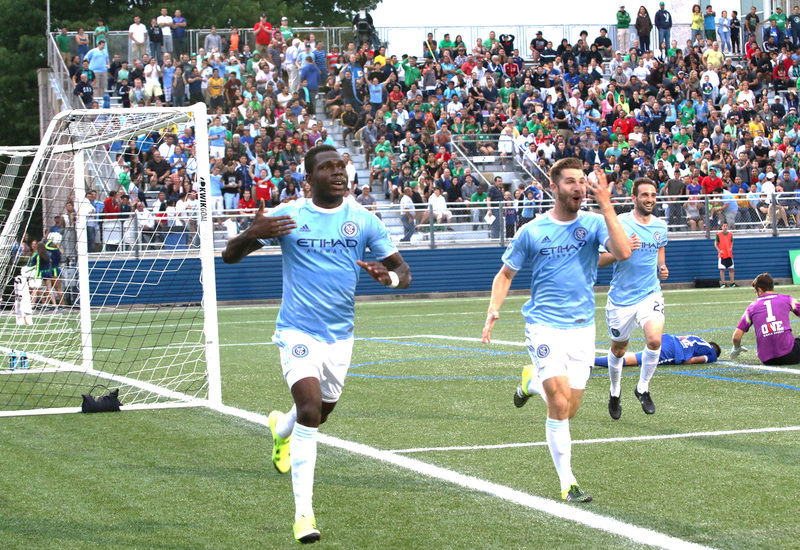 NYCFC midfielder Mix Diskerud (10) and the NYCFC supporters join forward Patrick Mullins (14) in celebrating Kwadwo Poku’s (88) opening goal against the New York Cosmos. 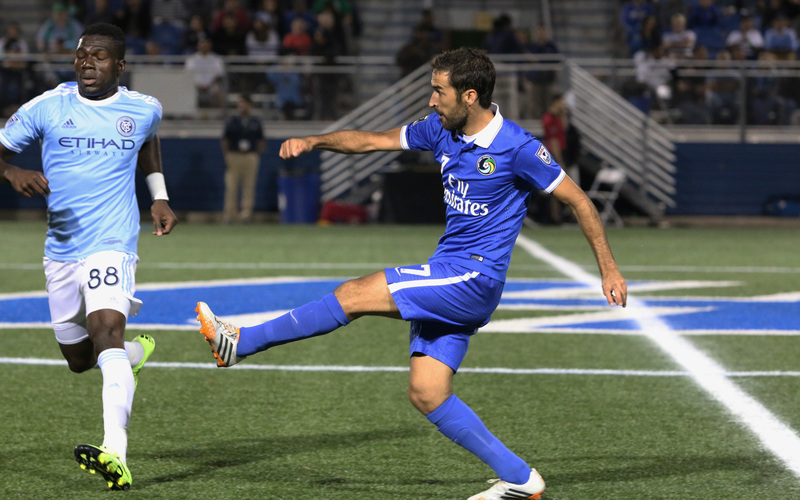 In the 57th minute of their U.S. Open Cup fourth-round match, Cosmos star attacker Raul (7) moves the ball into the attacking third, slipping it past midfielder Kwadwo Poku (88), NYCFC’s man of the match. 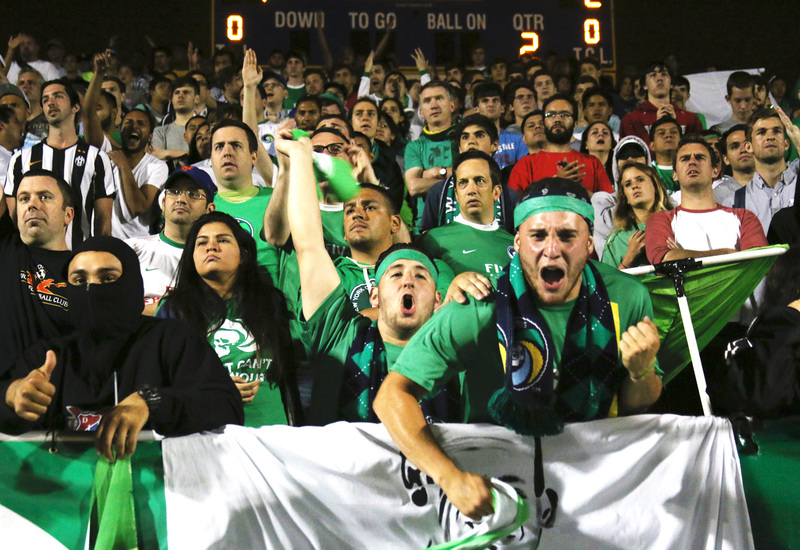 The New York Cosmos supporters section reacts to Lucky Mkosana’s (77) equalizing goal in the 91st minute, which sent the game to extra time. 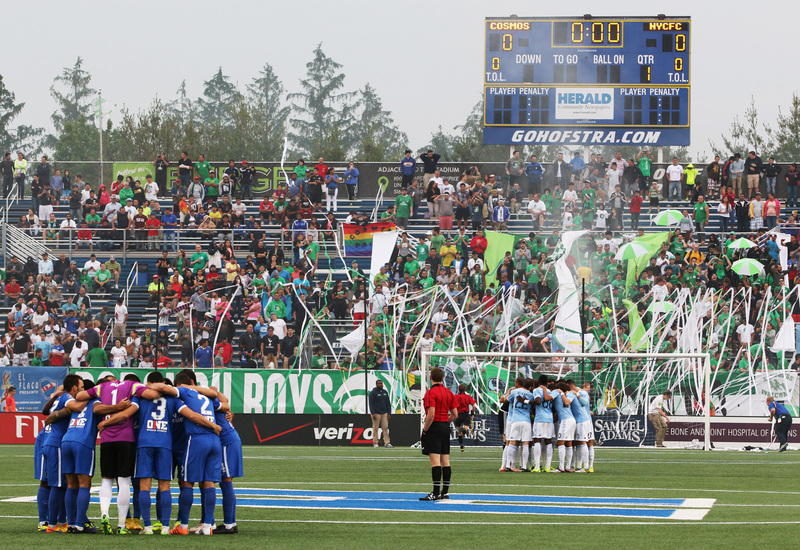 The Cosmos would go on to beat NYCFC in penalties, 4-3, to set up a round-of-16 clash vs. the Red Bulls. 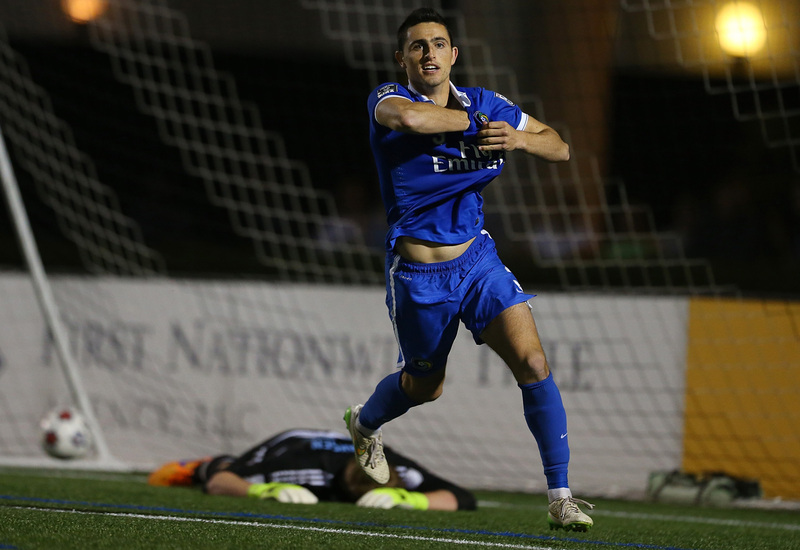 New York Cosmos' Hunter Gorskie celebrates after scoring the decisive penalty kick to send the NASL side by NYCFC in the U.S. Open Cup. 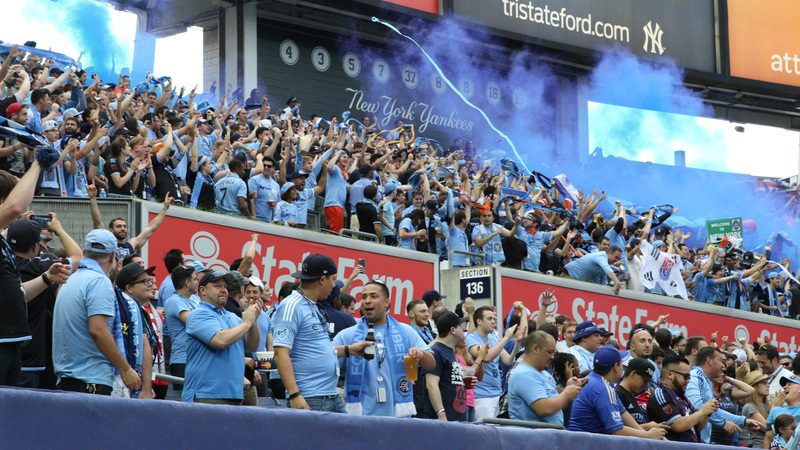 New York City FC home fans celebrate midfielder Tommy McNamara’s goal in the sixth minute of the team’s match against the New York Red Bulls at Yankee Stadium, ultimately won by the Red Bulls 3-1. NYCFC striker and captain David Villa sends a free kick into traffic near the New York Red Bulls’ goal in the first half of their clash at Yankee Stadium on June 28. 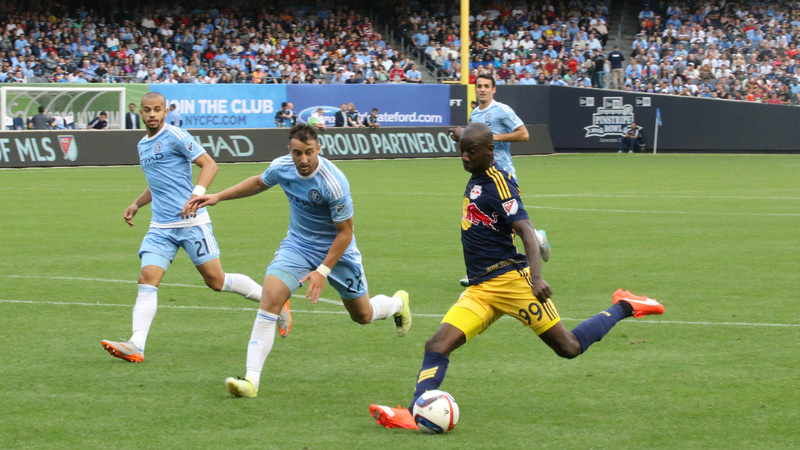 New York Red Bulls striker Bradley Wright-Phillips (99) beats NYCFC defender R.J. Allen (27) and puts a strike on goal during the second half of their June 28 match at Yankee Stadium. 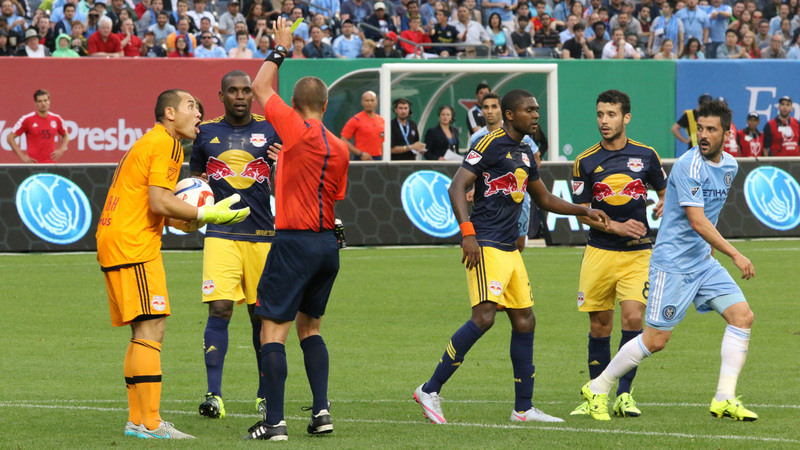 New York Red Bulls goalkeeper Luis Robles (right) reacts to receiving a yellow card for a foul on NYCFC striker David Villa (far right). New York Red Bulls striker Bradley Wright-Phillips (99) gets technical with the ball, controlling it while under pressure from NYCFC defender Jason Hernandez (21) and midfielder Javier Calle (30). New York Red Bulls defender Damien Perrinelle (55) shakes off Kwadwo Poku (88) and Mix Diskerud (10) during the second half of the season’s second Red Bulls-NYCFC clash. New York Red Bulls striker Bradley Wright-Phillips (left) celebrates with fellow striker Mike Grella (middle) and midfielder Felipe (right) after scoring the Red Bulls' first goal of the match, which tied the game less than two minutes into the second half. 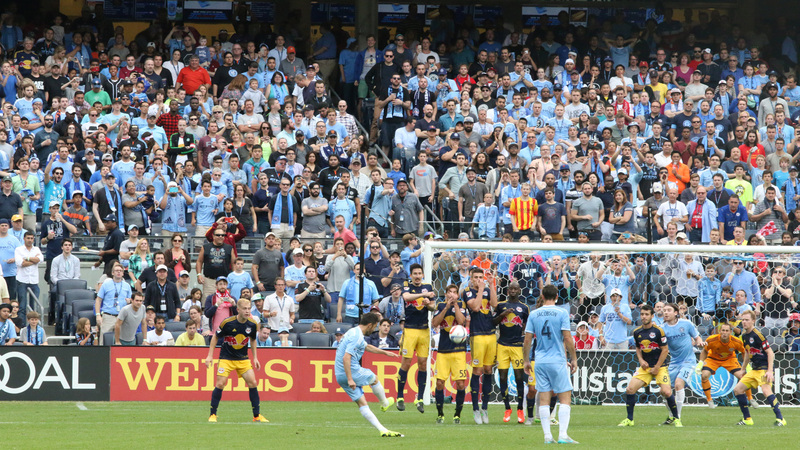 NYCFC striker David Villa (7) takes a free kick in the second half of the home match against New York Red Bulls. Defenders Damien Perrinelle (55) and Matt Miazga (20), midfielder Sacha Kljestan (16) and striker Bradley Wright-Phillips (99) make up the defensive wall. The New York Red Bulls run over to their bench to celebrate defender Chris Duvall’s (25) first goal in Major League Soccer. Strikers Mike Grella (13) and Anatole Abang (9) and defender Matt Miazga (20) join coach Jesse Marsch in the post goal embrace. 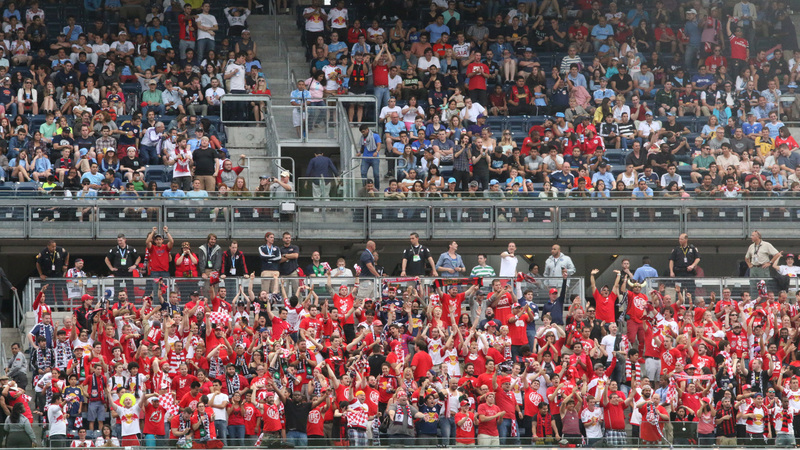 The traveling fans sitting in the New York Red Bulls’ supporters section at Yankee Stadium react to the third and final Red Bulls goal of the match, scored by defender Matt Miazga (20) in the 73rd minute of a 3-1 road win over NYCFC. After a 3-1 loss to the New York Red Bulls, NYCFC midfielder Mix Diskerud (10) throws a ball into the home supporters section. 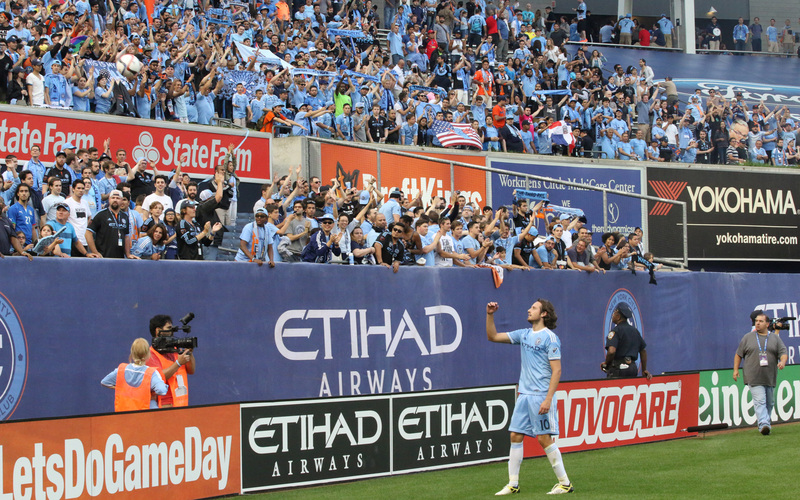 The gesture earned Diskerud one final cheer from his fans despite the result. 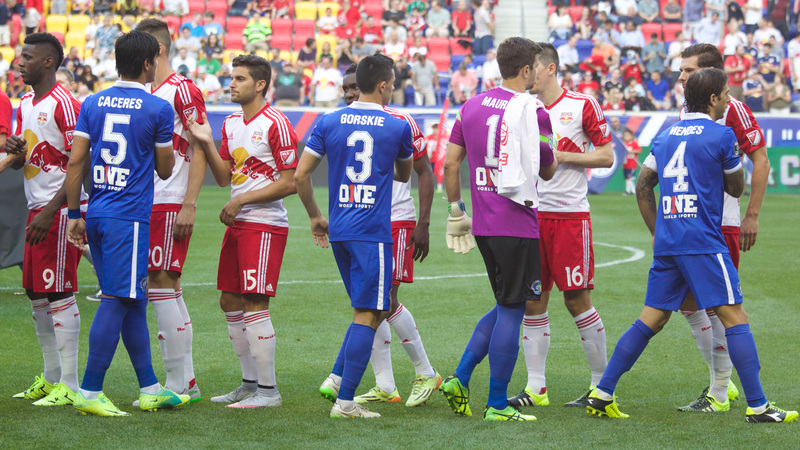 The New York Cosmos (Blue) and the New York Red Bulls (White) shake hands before the beginning of their U.S. Open Cup fifth-round match at Red Bull Arena in Harrison, New Jersey. New York Red Bulls defender Damien Perrinelle (55) and New York Cosmos midfielder Walter Restrepo (20) collide while vying for the ball in the first half of the 2015 U.S. Open Cup fifth-round match at Red Bull Arena. New York Red Bulls midfielder Sam Zizzo (15), already with a goal to his name in the match, fires a header toward Cosmos goalkeeper Jimmy Maurer (1). 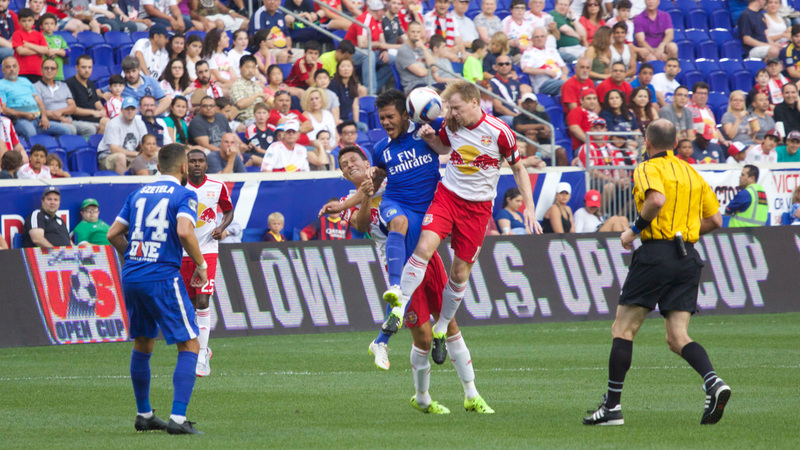 New York Red Bulls captain Dax McCarty (right) and Cosmos midfielder Andrés Alexander Flores Mejía (center) meet each other at the ball mid-flight in the first half of their U.S. Open Cup fifth-round match. 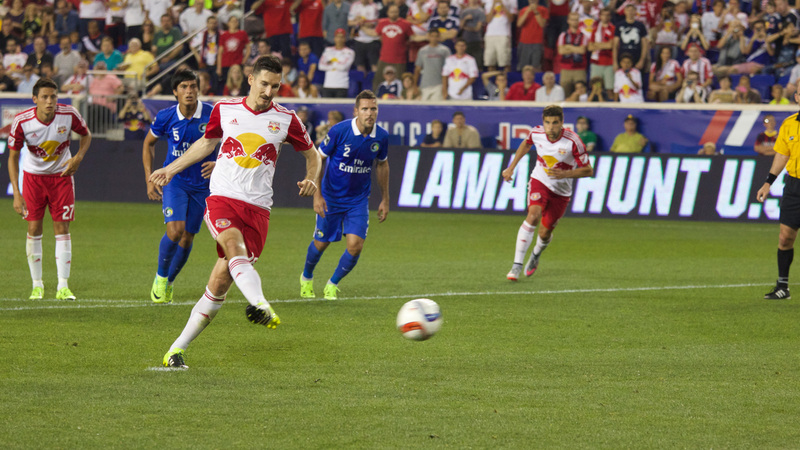 New York Red Bulls midfielder Sacha Kljestan (16) takes and makes the penalty kick, giving his side a 3-1 advantage over the Cosmos in the 54th minute of their 2015 U.S. Open Cup fifth-round match. 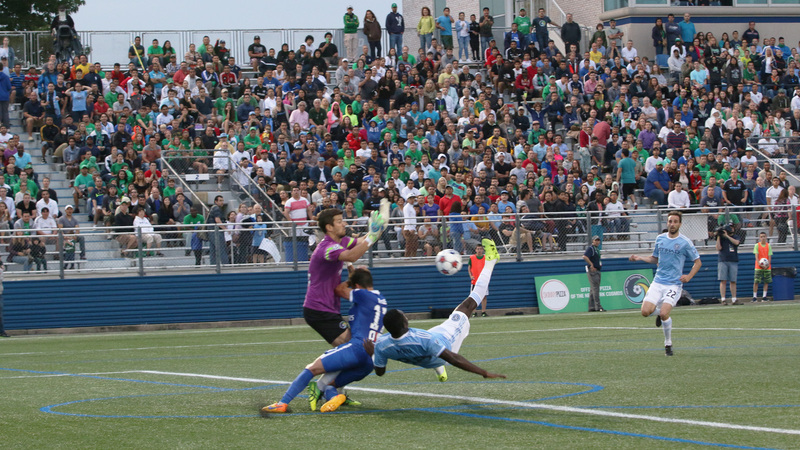 New York Red Bulls striker Anatole Abang (9) goes 1-on-1 against New York Cosmos goalkeeper Jimmy Maurer (1) in the first half of their U.S. Open Cup fifth-round match. New York Red Bulls defender Damien Perrinelle (55) and the Red Bulls’ supporters section call for a penalty after Cosmos defender Hunter Gorskie (3) fouled Red Bulls defender Chris Duvall (25) inside of the penalty box. Duvall broke his leg on the play. 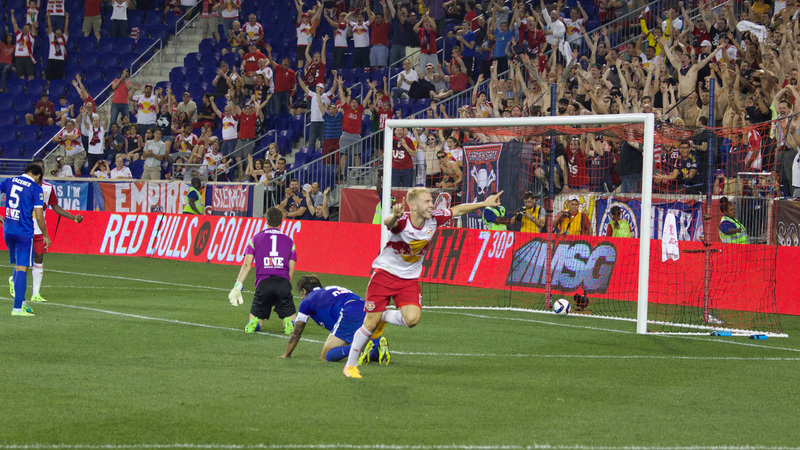 New York Red Bulls striker Mike Grella (13) celebrates his goal, the Red Bulls’ seventh in a week against the two other New York teams. 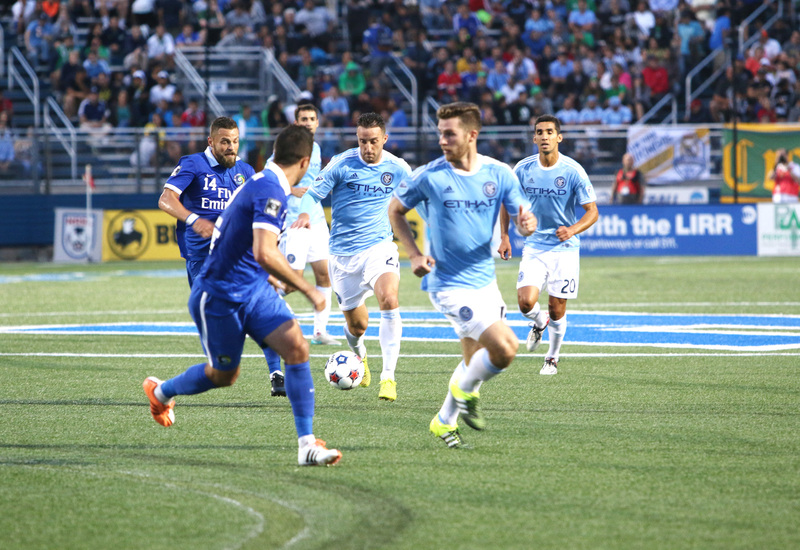 The 4-1 result against the Cosmos was preceded four days prior by a 3-1 victory over NYCFC. Red Bulls striker Anatole Abang (far right), captain Dax McCarty (middle), defender Anthony Wallace (left) and midfielder Dane Richards (far left) make their celebratory lap around Red Bull Arena with the blue jerseys they exchanged with members of the New York Cosmos. 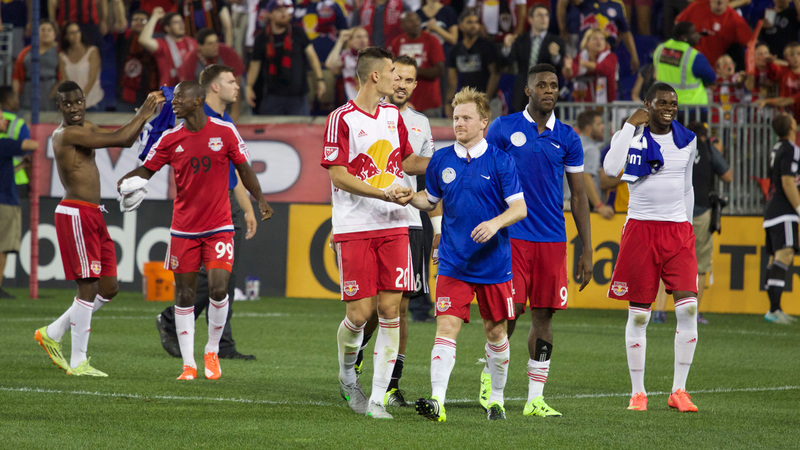 Defender Matt Miazga (20) and striker Bradley Wright-Phillips (99) are also pictured. 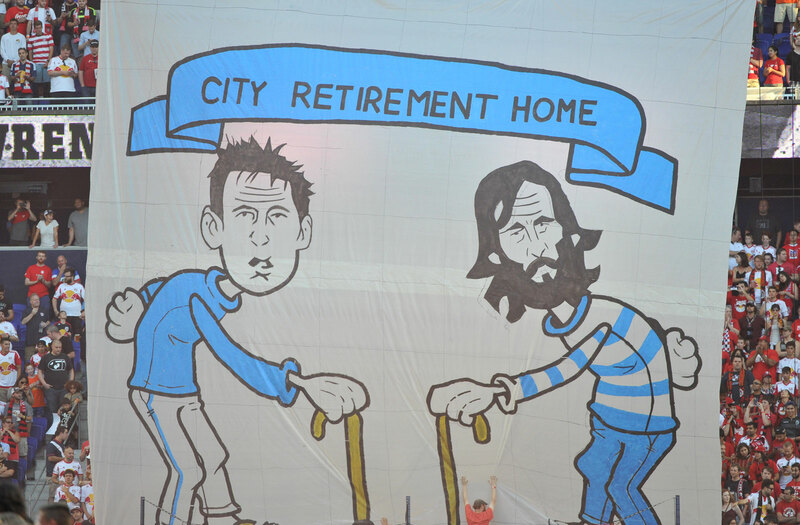 Red Bulls fans take a shot at NYCFC's two summer arrivals, 37-year-old Frank Lampard and 36-year-old Andrea Pirlo, ahead of their third MLS meeting of 2015. 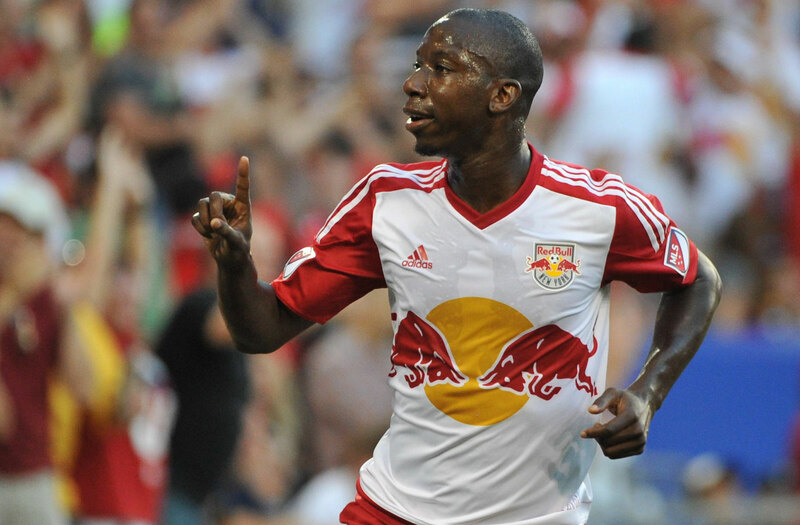 Bradley Wright-Phillips celebrates his goal that gave the Red Bulls a 1-0 lead over NYCFC in their third meeting of the 2015 season. Frank Lampard and Dax McCarty battle for the ball at midfield. McCarty's Red Bulls came out on top again, completing the season sweep with an Aug. 9 2-0 win. 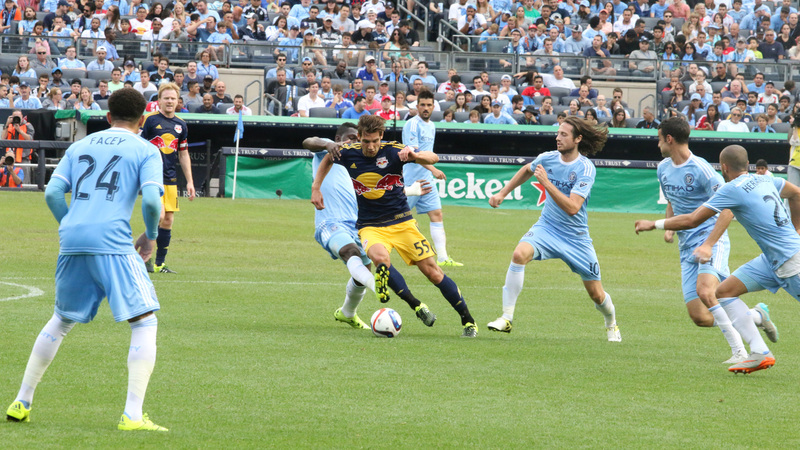 Red Bulls midfielder Felipe leaves his feet trying to stop NYCFC's David Villa. 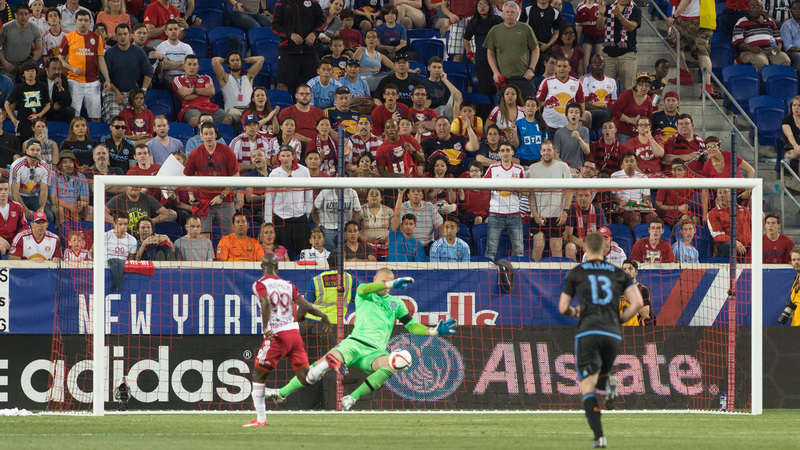 The former iced the 2-0 win at Red Bull Arena with a goal. Meanwhile in Toronto, Columbus Crew visited BMO Field for a matchup that was once so hotly contested that they dedicated a cup–The Trillium Cup–to it. However, those feelings have clearly fizzled. After a 0-0 draw that was well-played but not bad-tempered, neither team’s official website nor the league’s made mention of the Trillium Cup in postgame coverage. If there’s a complete opposite to the Columbus-Toronto rivalry, it was on display as Real Salt Lake visited Sporting Kansas City. There’s no hastily-created cup at stake, but ever since the Sporting KC’s victory in MLS Cup 2013 the teams have been at each other’s throats in dramatic, entertaining contests. That was the case once again as physical play dominated in Real Salt Lake’s 3-1 win. Eventually, both of these teams will lose many of the characters that made the matchup pop, and the rivalry will fade. And you know what? That’s OK. Rivalries don’t have to be permanent. Sunday’s formidable 1-2 Cascadia Cup-Calfornia Clasico punch of Portland vs. Vancouver and LA Galaxy vs. San Jose kept Rivalry Week from being a complete misnomer, but three seasons after the concept was introduced to MLS it still feels forced. There simply aren’t enough consistently-entertaining rivalries to sustain it. Considering the youth of the league, that’s entirely acceptable. Sure, he was doing it against a porous NYCFC defense, but two goals (including a bicycle kick) and an assist is nothing to sneeze at, especially with as much as Wright-Phillips had been struggling in the early season. Really, though, this award should go to the entire Red Bulls team, who had five goal scorers and four assist providers involved in its seven goals against NYCFC. 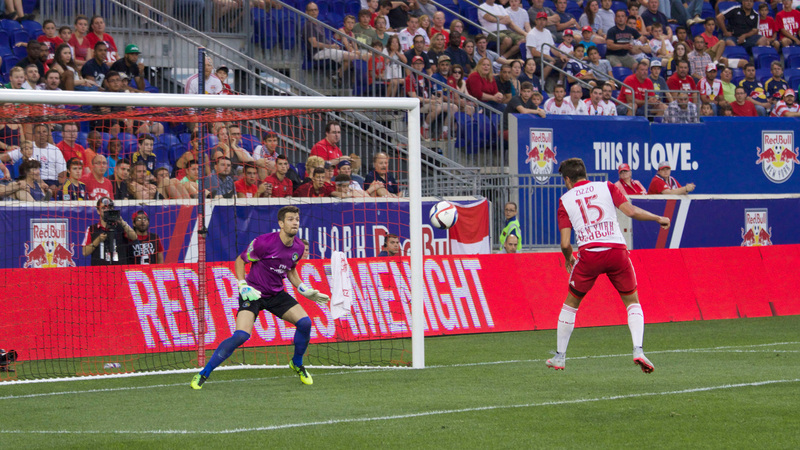 The Red Bulls tied the MLS record for largest margin of victory with a 7-0 win. Burch played a huge role on both sides of the ball for the Rapids in the team’s 1-0 win at Seattle Sounders. Under pressure the whole game, Burch made a variety of key interceptions and came up huge with a goal-line block that preserved the win for Colorado. As if that wasn’t enough, he also assisted on his team’s only goal, delivering the corner kick that Axel Sjoberg buried just before halftime. Even with Seattle in the midst of an up-and-down year, it’s no small feat to head into CenturyLink Field and get a result. That the result was a win is even more impressive. The Rapids haven’t lost in eight games, a run that’s tied for second-longest in club history and just one away from tying a club record. There’s no doubt about it: Colorado is the most in-form team in the league right now. The Galaxy are riding a nine-match undefeated streak, so on the whole things are pretty good for Bruce Arena’s side. However, five of those games have ended in draws, and the Galaxy haven’t hit upon much consistency in their performances. Sometimes they look like world-beaters. Sometimes, as in their 1-1 home draw against San Jose in which they conceded a late equalizer, they are underwhelming. Real Salt Lake was under pressure for much of its match against Sporting Kansas City, but managed to take advantage of its chances to earn a 3-1 win away from home. Opportunistic finishing is only part of the team’s success, though: Much is also owed to a solid defense, particularly central defensive partners Aaron Maund and Justen Glad. The Earthquakes did what they’ve been doing all year in Sunday: Grind out a result in an unfavorable environment. Were it not for Marvell Wynne’s sloppy own goal, it might even have been a win. The key now for San Jose will be to string together more than three positive results in a row–something the team has yet to do this season. It was triumph enough that everyone playing in Friday’s dull 1-0 win between Philly and D.C. United didn’t fall asleep on the field. That the Union were awake enough at the end to nab a late winner through Richie Marquez feels like a miracle. The Union are now unbeaten in five and re-take a surprising lead at the top of a (very weak) Eastern Conference. Dallas’ rough stretch appears to be over, as Oscar Pereja’s side kept last week’s good results going with a 4-2 win at New England. The win is much needed for a Dallas team that struggles away from home, and that it was achieved despite being down 2-1 within 30 minutes says a lot about the team’s mentality. The Timbers rebounded from a tough loss last week to earn a 4-2 win over Vancouver Whitecaps. Leading scorer and Golden Boot candidate Fanendo Adi sat this one out with a hamstring injury, but the Timbers were helped by a pair of PK calls and solid games from Diego Valeri, Darlington Nagbe, and Jack McInerney. 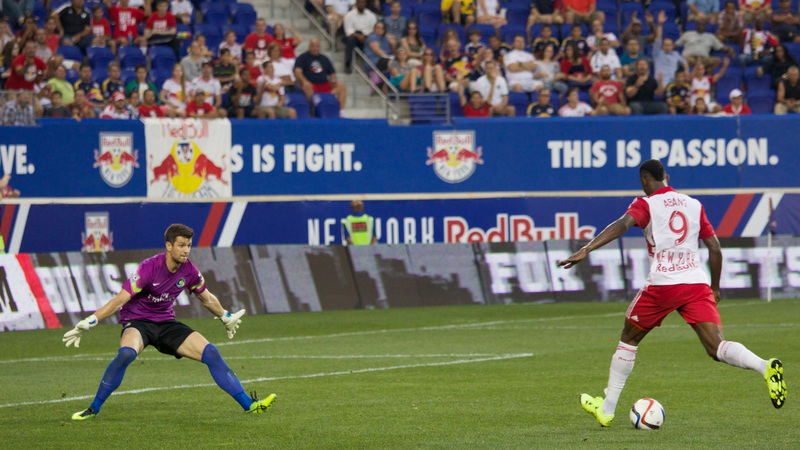 The Red Bulls followed up a bad loss to D.C. United with two wins that displayed a variety of strengths. 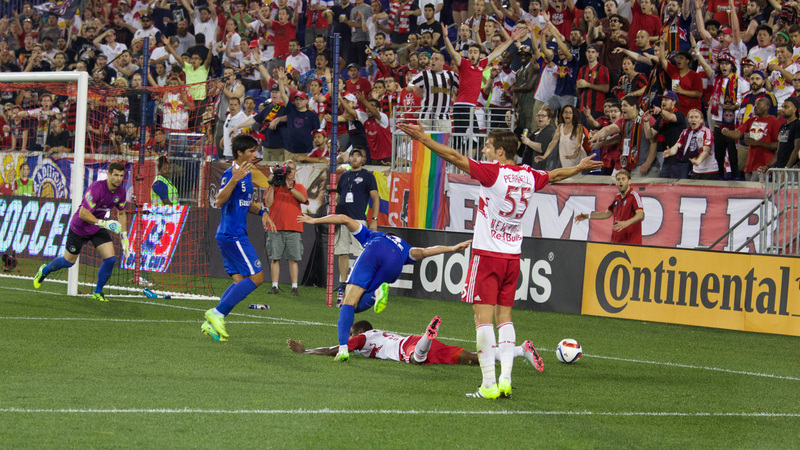 Wednesday’s 1-0 win over Chicago tested their ability to break down a compact defense. 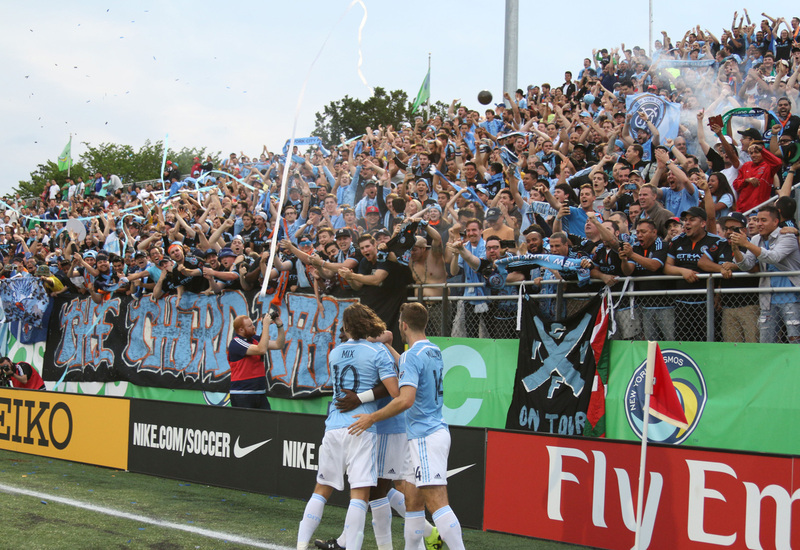 Saturday’s 7-0 demolition of NYCFC showed how ruthless the team is capable of being when given enough chances. After such a positive start to the season away from home, then a nice victory in the first game at the new BMO Field, things seems to have stagnated a bit for Toronto FC. The Canadian side couldn’t generate many clear chances in a 1-1 draw vs. NYCFC Wednesday, and every one of its eight shots in Saturday’s 0-0 draw with Columbus came from Sebastian Giovinco. It's a boon for TFC that Italy will not call on Giovinco for Euro 2016. The Sounders held 66% of possession and generated 17 shots against Colorado, but couldn’t find the finishing touch on any of them in a 1-0 home loss. Jordan Morris, just after it was announced that he would miss out on playing in Copa America, missed several key chances. Vancouver followed up last week-s high-flying performances with a thud, losing 4-2 at Cascadia rivals Portland Timbers. The Whitecaps shot themselves in the foot on numerous occasions throughout the game, with Pa Modou Kah having a particularly nightmarish game in central defense. Kekuta Manneh continues to be terrific, though, so it’s not all bad. For all of this team’s hustle, bustle, and industry, it simply hasn’t been able to score enough goals to win games. After Saturday’s 3-1 home loss to RSL, Kansas City has taken the most shots in the league (197) but has scored the fifth-fewest goals (14). The only reason they haven’t dropped in these rankings is the poor form of the teams below. When Cyle Larin and Kaká are both playing well Orlando can be difficult to stop, and that was proven on Saturday as Laris scored twice on two Kaká assists in a 2-1 win over Montreal. That result halted a six-game run without a win for the Lions, who will host Eastern Conference leaders Philadelphia on Wednesday. Montreal has hit a tough patch after such a good start to the season, with Saturday’s 2-1 loss at Orlando being the team’s sixth game without a win. However, four of those six have been draws, and Montreal created enough chances at Orlando that on a different night they might have gotten another point...or maybe even three of them. That D.C. United struggled to break open a dull game is a little worrying. That it gave up a last-minute goal to ruin its chances of an away point is more worrying. One small positive came in the form of Travis Worra, who has come out of nowhere to be a steady presence in the D.C. goal with Bill Hamid injured. It may seem hard to believe, but NYCFC started off the week on a positive note! 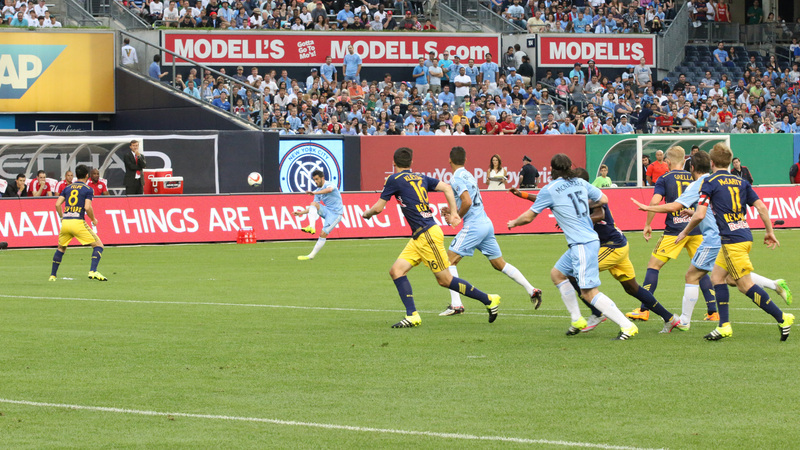 A 1-1 draw at Toronto with David Villa and Andrea Pirlo rested is nothing to sneeze at. Then...Saturday happened. A 7-0 loss at home to your chief rival with Villa and Pirlo on the field is nothing less than a disaster. Frank Lampard did make his season debut, entering to a chorus of boos from the crowd on a lost day at Yankee Stadium. Playing away from home is never easy, but Dynamo couldn’t have had a much easier assignment than facing the Chicago Fire, who had only won once in their opening 10 games. Instead, the Dynamo were dominated in a 1-0 loss that also saw DaMarcus Beasley substituted due to injury. With Kei Kamara gone, Columbus is going to have to rely more on its defense to get results. That’s exactly what it did in Saturday’s 0-0 draw at Toronto, but the road will get much tougher from here. Gaston Sauro, the team’s best defender, suffered a torn PCL in the game and is out for four months. 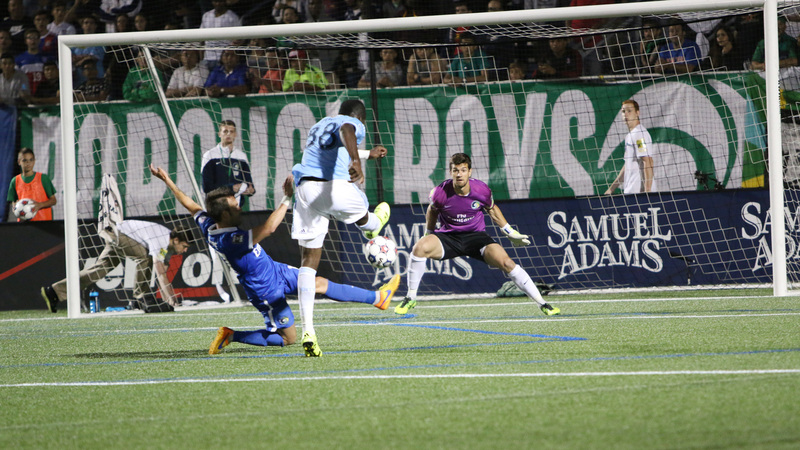 The Revolution did well to build a 2-1 lead after a suspect penalty gave FC Dallas an early lead. The Revs’ defense hurt them again in the second half, though, as Sporting CP loan acquisition Sambinha gave away the winning goal with a sloppy giveaway. Kamara is still waiting for his first goal in Revolution colors. 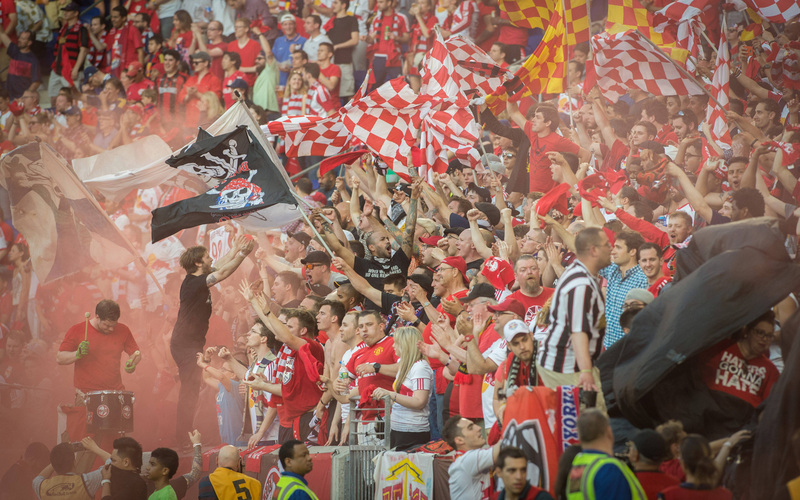 The Fire ended a grueling run of four games in the past two weeks with a loss at New York Red Bulls and then, finally, a win. Saturday’s 1-0 result vs. Houston could have been won by many more, but the three points and Gilberto’s active performance up top will serve as slim rays of hope for a team in desperate need of those.